Is Alain St.-Georges Alive and Well and Living (it up) in Paris? 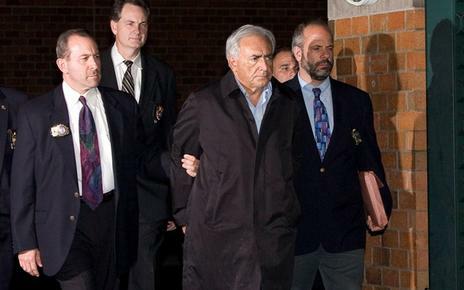 J.J. here…It looks as if fate has turned again for M. Dominique Strauss-Kahn, and in another stunning reversal of fortune, he may soon be a free man. He may even, who knows, once again be the Socialist candidate and a real contender to become President of France. If so, the real question will be, how many women support him now? For DSK, as he is known, the fall from grace – and his world leadership position as head of the International Monetary Fund – came with the seemingly credible accusation of a chambermaid, a young immigrant from Guinea, that he assaulted and raped her after she entered his swish New York hotel room to clean it. He was snatched from a Paris-bound flight out of JFK, arrested by New York law enforcement officers, and famously photographed handcuffed and disheveled. Then it turned out that the chambermaid had her own issues – lying among them – and that her plausible story was full of holes. So DSK is out of jail and may soon be released to France, where he has been portrayed as a kind of hero victimized by an out-of-control American justice system and crazed press. The problem, the theory goes, is vengeful and puritanical America, not a man known (and renowned) for his sexual appetites. Hmm. Why do I think I’ve seen this movie before? It all takes me back to those long-ago days at the Sorbonne when three of my friends had encounters with the suave, cravat-wearing, silver-haired seducer, Alain St.-Georges, famous prof of political science and specialist in American affairs. Each of the entanglements ended badly, but then there wasn’t even a vocabulary to deal with it. True, nobody was raped. But sexual harassment, predatory behavior, imbalance of power, victim’s rights? In 1962, all such concepts were still in the future. As was the idea of women’s solidarity. If my friends had publicly complained, they would most likely have suffered public ridicule. Those pathetic, puritanical pin-heads. Those Americans.